With more power and torque, smoother speed and longer battery life, our newest electric model is powered by a AC-powered brushless motor that sets new performance standards for multi-terrain vehicles. The independent articulating rear suspension system with solid rear axle gives this Bad Boy more traction for climbing the toughest terrain and hauling the largest loads. 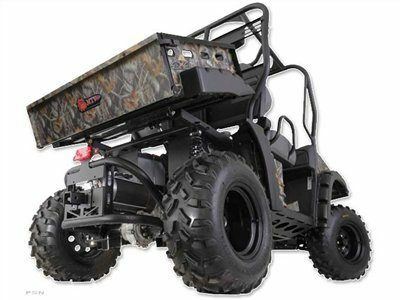 In fact, it’s so powerful that when hooked back-to-back with a gasoline-powered UTV - and the pedals are floored - it’ll drag the gas UTV right out of its ruts. Available as a four-seater and road-worthy LSV models, this MTV is so unique that even if you’ve driven other electric vehicles before, you still have never driven an electric like this. We’re charging ahead in the world of multi-terrain vehicles and we’re taking the market by storm. 7.75 in. from the lowest point of the frameAt the Frame: 14.5 in.